Joseph Shemaria graduated from UCLA Law School in 1969, with the most prestigious academic honors. He was also a Senior Editor of UCLA Law Review and graduated "Order of the Coif," the highest academic award. 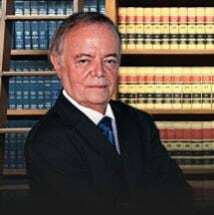 Mr. Shemaria started specializing in criminal defense in June 1970 and has tried cases in both state and federal courts from coast to coast. He has also handled over 1,000 state and federal appeals and writs, 30 of which were published in the permanent, official law books. Mr. Shemaria has spent virtually his entire professional life, on a daily basis, defending those accused of crimes. A wise judge said, and Mr. Shemaria believes, the criminal justice system can be like a fast-moving freight train — the only justice you can hope to get is the justice your attorney gets for you. You must pick your lawyer very carefully. There is no room for another error in judgment! Mr. Shemaria's entire focus will be to get you "off the train," with the least, or no, damage.